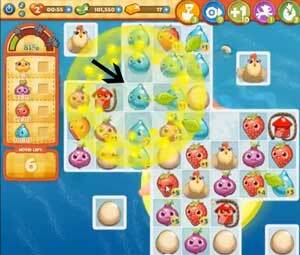 These Farm Heroes level 593 cheats and tips will help you beat level 593 of Farm Heroes. 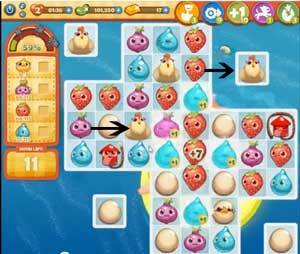 The objective of Farm Heroes level 593 is to collect 3 chicks, 115 onions, 115 strawberries, and 115 water droplets in 16 moves. Level 593 Cheat #1: Make matches next to the fireworks. On the board you will notice the four hens outside of the main board. In order to get them on the board to start laying eggs, you will need to make matches next to the fireworks. After three matches the firework will employ fire bombs around the board. Continue to make matches next to the fireworks in hopes of havin the firebombs reach the hens. This may take a few tries. Level 593 Cheat #2: Combine the eggs. Once the hens are on the board, they will begin to lay eggs. Continue to make matches next to the hens to keep them jumping around the board. Try to get as many hens on the board as possible. This will increase your chances of fulfilling the task of collecting three chicks. Level 593 Cheat #3: Take advantage of the cascade effect. The board is filled with resources that you need to collect. There are no other resources that you will need to worry about. This makes the cascade effect come into play. 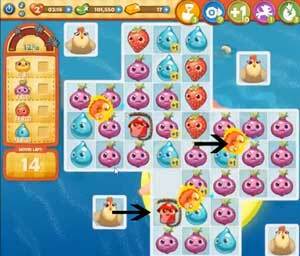 Throughout the level you will notice that large combinations happen often. Although the cascade effect is good, make sure that you take the time to look around the board after each move. You do not want to miss a great opportunity to hatch the eggs!